Answering Muslims: I love Muhammad (p.) because I am Baha'i. I love Muhammad (p.) because I am Baha'i. Baha'i is one of the Abrahamic religions. Baha'is worship the same God as Muslims but have a later more complete revelation which explains everything. You cannot be a Baha'i if you do not love Muhammad and all the prophets. The Qur’an foretells the coming of Baha'u'llah. Islam does not accept these Baha'i claims. It says that the Baha'i religion does not take Muhammad and his teaching seriously, and instead imposes a Baha'i interpretation upon his life and the Qur’an. I agree, but what I find interesting is that Muslims use these same claims to promote Islam to Christians. 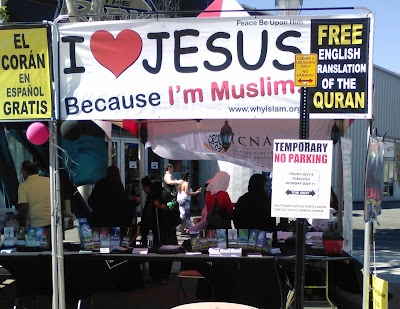 And for the same reasons why Muslims do not accept the Baha'i claims, so too Christians do not accept the Muslim claims: Islam does not take Jesus and his teaching seriously, and instead imposes an Islamic interpretation upon Jesus’ life and the Bible. Muslims love Jesus the same way Baha'i love Muhammad. If you love Muhammad you will read the Qur’an and Hadith. If you love Jesus you will read the Bible. I don't know much about baha'i, but i imagine that the Islamic doctrine of abrogation would make it harder to outright reject the claims of such groups attempting to add revelation even if this revelation is contradictory. Wonderful analogy, Mr. Green. Thank you.